COLORS INFINITY launched with a promise of giving its viewers a unique Television experience. True to its word, the month-old English General Entertainment channel is ready with its explosive new line-up of shows in September, and it doesn’t just stop at that. Taking it up a notch, COLORS INFINITY will be airing shows just 12 hours after their US telecast. The new line-up boasts of award winning and globally acclaimed shows, like Mr. Robot, Tyrant, The Last Ship, Chasing life, The Night Shift and the weekend special Black Mirror, all of which will be aired in India for the first time. 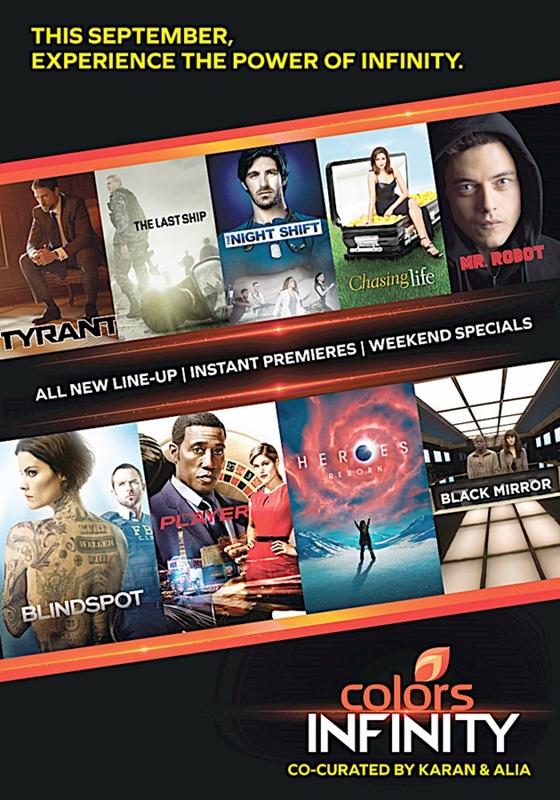 In addition to the alreadypower-packed line-up are the Instant Premieres, which will air within 12 hours of the US telecast, with shows like The Player, Heroes Reborn, Blindspot, The Flash (Season 2), iZombie (Season 2), Arrow (Season 4) and Fargo (Season 2). Each series has been hand-picked for its great content and global popularity, whether it’s the Wesley Snipes starrer, The Player or The Last Ship, which has been directed by Michael Bay, the creator of the Transformers franchise. Or the new seasons of hugely popular shows like The Flash, Arrow and Heroes Reborn, which bring back your favorite superheroes to Television. The award-winningseries Fargo, returns with its second season to play with the viewers’ mind once again. The new-age technology thriller, Mr. Robot is not only popular amongst the neo-urban youth, but it has been critically appreciated as well. It has received rave reviews internationally – on IMDB it has a rating of 9.1 and a 97% on Rotten Tomatoes. With the fresh line-up and Instant Premieres, COLORS INFINITY is set to bring a whole new perspective to English language Television, starting this September. On the rotation of shows and simulcast, Ferzad Palia, EVP & Head of English Entertainment, Viacom18, says “We started with the idea of disruption in the English entertainment arena in India, with back-to-back episodes and now we up the ante with our Instant Premieres, where we will be airing the biggest new series and seasons within 12 hours of the US telecast. Viewers here will be watching incredible new shows on COLORS INFINITY, only a few hours after their American counterparts. There is no need to illegally download anymore.” Carving out an entirely new landscape in the English GEC space, COLORS INFINITY heads for even newer horizons. Dwarka Ramlila can become No. 1 Ramlila of the capital.